Our reviews are totally independent reviews that are supplied and vetted by the "Free Index" business web site. 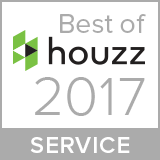 We have also just been given an award for customer service from Houzz the leading platform for home renovation and design. We were chosen by the more than 40 million monthly unique users that comprise the Houzz community from among more than one million active home building, home improvement and design industry professionals. We are aware that unfortunately there are unscrupulous companies that post bogus reviews and project pictures on to their website. We are therefore always more than happy to provide evidence of our completed projects and client reviews posted in order to verify their authenticity.